I tried reading “A Christmas Carol” by Charles Dickens to my kids (ages 10 and 7) but we did not get very far. The language is not very kid friendly. Dickens dances around the ideas he is trying to convey especially in the beginning. The tangent he goes off on about the door nail is a good example. I love the line “the wisdom of our ancestors is in the simile.” It is true. Ideas bubble up through our societal and historical subconscious making elegant connections and if we discard them or tamper with them they undermine the social fabric. Kids, of course, want to be read a more straightforward story, which is too bad because I love the book. I suppose my kids will have to be introduced to “A Christmas Carol” the way I was. That is, by watching one of the many dramatizations produced over the years. I think the first one I ever saw was a cartoon version. I remember watching TV lying on my parents’ bed one afternoon around Christmas time. I was alone and it felt cozy. There are so many images in this story that make the outside world dark and cold but the inside is lit and warm. The best version I ever saw was the version where Patrick Stewart played Ebenezer Scrooge. The actors were appropriately cast. Whereas, the worst was the one where George C. Scott played Scrooge. He did not convince me that Scrooge was a terrible man. Also, the actor who played Bob Cratchet appeared too well fed and philosophical for the role. There was also a musical version I remember liking but it has been so long since I have seen it I am not sure I would like it still. In the opening paragraphs, Dickens goes on and on about how Marley was dead and that this must be understood if anything good was to come from the story. I have often wondered why Dickens thought the reader would have a problem believing that this particular character was dead. My suspicion was that this phrase, “Marley was dead: to begin with. There is no doubt whatever about that,” popped into his head and inspired him to write the story about a dead character reaching back from beyond the grave to affect matters in the material world. Perhaps Marley was originally intended to be the main character before Scrooge revealed himself to Dickens through the creative process. Really the first four or five paragraphs can be removed without taking anything from the story. It seems to me that Dickens was brain storming here and arrived at what the story is really about in the sixth paragraph, Scrooge and his redemption. But then, I suspect there were a few turns of phrase that Dickens became attached to (like “the ghost of an idea”) and left them in. Thanks for linking to my post about Christmas Carol obscurities at Balladeer’s Blog! Glad you liked it! I’ve got dozens of articles about A Christmas Carol over here. 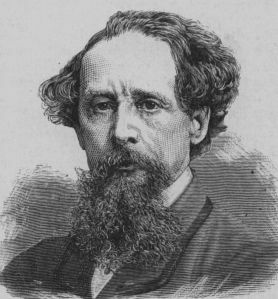 With Dickens, a lot could be removed without affecting the story, but I would not have one delicious word tampered with. Nobody writes as joyfully as Dickens – the word-play is just marvelous.